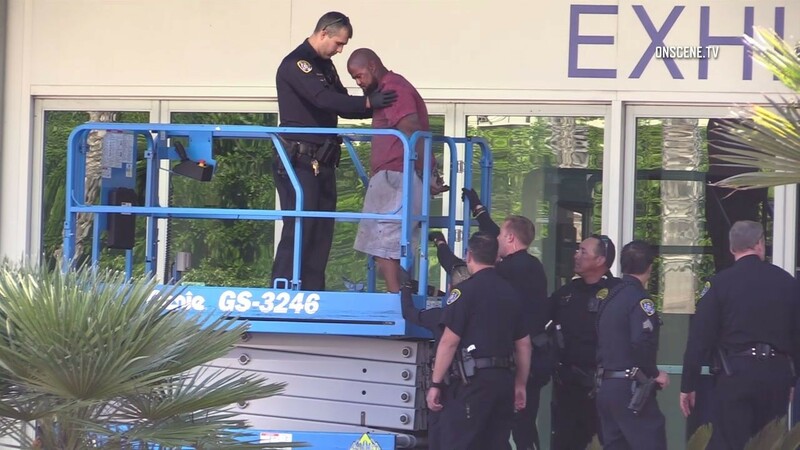 A man who climbed onto the roof and facade of the San Diego Convention Center Monday afternoon and stayed perched on the building for nearly two hours has been taken into custody, according to San Diego police. The man was first spotted on the roof of the landmark bay-front structure at 111 W. Harbor Drive sometime around 2 p.m., after which he climbed and jumped down to third- and second-floor overhangs, according to news wire reports. San Diego police and firefighters responded to the scene. There are reports the suspect was carrying a knife, but threw it down when officers arrived; he later appeared to be smoking a meth pipe, according to the news wire reports. Emergency personnel raised a “cherry picker” extension platform to near where the man was perched as they talked him down, the San Diego police spokesman said. He finally complied with orders to get into the cherry picker basket and was lowered to the ground before being arrested, the spokesman continued. The suspect’s name and age have not been released.